Nowadays, motorcycles are getting more and more common on our roads and mainly the big bikes. I think one of the primary reasons as to why people are turning into using motorbikes is because it’s a cheaper mode of transport. Alter getting that bike it is now the time to buy its accessories. One of the accessories that are essential for a bike is the motorcycle saddlebag. Why is it necessary to have this accessory? 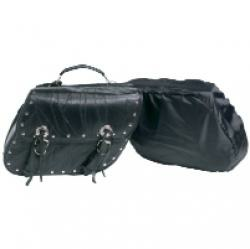 Leather motorcycle saddlebags give you that rock sensation when you are riding on your bike. The saddlebag also provides you with more storage room for your other accessories when traveling. The saddlebag immensely increases your bike’s carrying capacity. A lot of stuff can fit into a saddlebag more than a backpack can carry. Saddlebags also add beauty to your bike. If going on a trip for a few days, there is no need to worry about carrying the essential travel accessories with you because a saddlebag solves that problem for you. Motorcycle saddlebags are available in different styles and sizes which makes it easier for any bike owner to find one that fits their bike. When you use a saddlebag on your bike, a nice flair is added to your bike making it look awesome. This entry was posted on Tuesday, February 12th, 2019 at 12:12 am	and is filed under ATV bags. You can follow any responses to this entry through the RSS 2.0 feed. Responses are currently closed, but you can trackback from your own site. Different Kinds of Motorcycle Bags. Open Road Luggage Blog social media advertising by iePlexus.com.